CBSE PRIVATE CANDIDATE – COMPLETE YOUR SCHOOL EDUCATION COMFORTABLY WITH OUR HELP! 12th CBSE Private, 10th CBSE private Candidate Admission. CBSE private candidate admission form 2019-20 for students who want to appear CBSE board exam for 10th or 12th in Delhi. CBSE PRIVATE CANDIDATE is a best opportunity for all those students who are unable to Join the regular schooling for their basic school education of class 10th or 12th. The reason behind this may be either they are school dropout or fail in school final exams of class 9th or 11th. 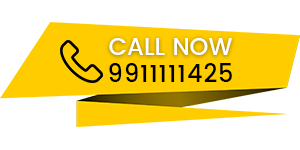 If you are a student looking for such an option and want direct admission in class 10th or 12th, Call us now for your admission at our helpline numbers 9911111425, 9911111525 for registration & classes. CBSE Private candidate Admission class 10th – Who can apply? 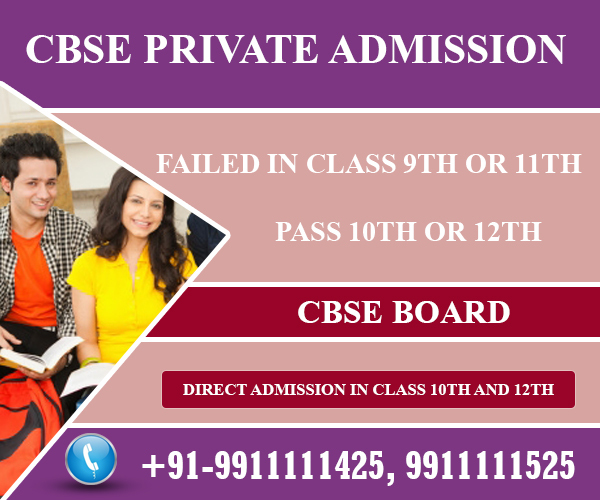 JOIN CBSE PRIVATE CANDIDATE ADMISSION 10th CLASS WITH OUR HELP AND PASS! CBSE Private Candidate Admission Class 12th – Who is eligible? CBSE Private candidate admission class 12th is a new hope for students to appear in CBSE Board exams class 12th who are unable to join the regular school due to their reasons. Now these students without joining a regular school can appear in class 12th in any of the streams arts commerce or science. All the following students can apply for admission in class 12th. a) All 10th class passed students from any recognized board in India with one year gap. b) All regular school going students appeared in school final exams for class 11th but could not qualify or in other words all 11th fail students can apply. JOIN CBSE PRIVATE CANDIDATE ADMISSION CLASS 12th WITH OUR HELP AND PASS! 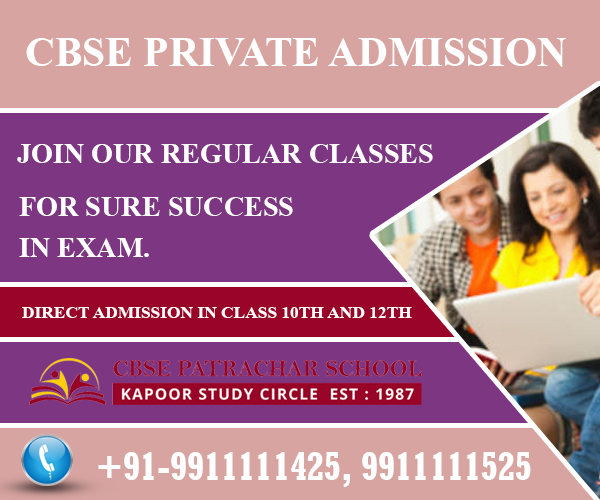 CBSE PATRACHAR SCHOOL helps you get CBSE Private Admission and get pass through private coaching! Given to CBSE Private Candidates. The school board exams of 10th class and 12th class are important mile-stones in anyone’s life. After passing 10th class – secondary school leaving certificate – anyone can continue their studies in the regular schools of boards of education in India, in any state for class 11th and than class 12th. After passing 12th class – senior secondary school certificate – the candidate becomes eligible for joining any college or university in India or abroad, for achieving graduation in any faculty of studies. But according to Indian schooling system, 9th standard and 11th standard courses will have public examinations that allow the student to appear for only once. Unfortunately if the student gets fail marks in any subject, he or she will be expelled from the regular schools. Failed students in 9th or 11th standards cannot join any regular schools and study the same class again. They have to get their transfer certificate and leave the school life, once and for all. Their career ambitions will be put a full-stop thus. For all of the above unlucky students, there is still hope to fulfill their ambition. CBSE Private Admission paves the way. By enrolling as students for CBSE Private Admission through CBSE PATRACHAR SCHOOL , both for 10th standard and 12th standard CBSE courses, they can complete their aim in school education, pass the respective courses and seek their career opportunities gladly. Already thousands of students have brightened up their future, by the timely service of CBSE PATRACHAR SCHOOL for the last 25 years. If you approach CBSE PATRACHAR SCHOOL for help, our expert councilors will take care of you, In not only securing admission for CBSE Private Admission, but also prepare you well for appearing in either 10th class or 12th class CBSE public exam, as the case may be. CBSE PATRACHAR SCHOOL conducts study centers in Delhi. We conduct special coaching classes during school time, evenings and special timings during week-ends etc. Expert teachers with their vast experience know how to illustrate the lessons and subjects of CBSE syllabus, and make the students understand them clearly. For this purpose, they use sophisticated equipment’s like study materials, notes, guides and answers to previous question papers etc. The student thus sharpened up in skill can face the 10th or 12th exam with renewed confidence. You can never fail. A) If you are pass/failed in class 9th from a regular Recognized school your Original school leaving certificate Duly Countersigned by the education officer of the area. Passed In Class VIII (With One Year Gap) From A Recognized your Original school leaving certificate of class 8th pass/fail Duly Countersigned by the education officer of the area. B) The Candidate Must Have Completed 14 Years of Age as on 31st March in the year in which you want to take admission. a) The students studying in a regular school (Male & Female) who have passed or failed in class XI( Science/ Commerce/Arts) after passing class X examination on the basis of original School leaving certificate duly countersigned by Education Officer/Competent Authority and attested photo copy of class 10th pass report card/mark sheet. Those students (Male & Female) can take admission directly to class XII having at least one year gap after passing class X exam from recognized Board on the basis of original school leaving certificate of class xth pass duly countersigned by Education Officer/Competent Authority with photo copy of class 10th pass mark sheet. a) Ration Card showing the name of the candidate in legible form. b) the Voter I-Card showing the name of the candidate in legible form. In case of Minor, the Voter I-Card of his/her parents is also acceptable. f) Current Rent agreement in the name of parents/ candidate as a tenant. g) Self attested Photocopy of Driving license in the name of candidate issued from Delhi Transport Authority. h) Affidavit for residence proof in Delhi issued by SDM/lst Class Magistrate.